Based on H.P. 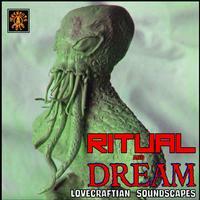 Lovecraft, this album is suitably creepy. At times it can be downright frightening. I’m not sure it’s progressive rock. It’s definitely short on the rock side of the equation, usually landing near atmospheric. It’s certainly progressive, though. Creepy and also quite beautiful, this includes atmospheric music, bits of processed words and sound effects. It builds ever so gradually. It is ominous, but also possesses a lot of magic. It’s oddly pretty. This is less atmospheric, but no less effective. It’s got powerful melodies, dramatic textures and other elements. It’s dark and a bit more energized than the previous cut was. It includes some Lovecraftian chanting and rituals along with the songs of dogs and unknown creatures more unsettling. With a lot of spoken voices and weird atmospherics, this is a powerful number. It’s slow moving, but it’s also dramatic. Those voices really create an amorphous wall of sound. There are classical elements here in a lot of ways. Yet, it’s quite alien in texture at the same time. I love the spoken section, a bit like some chorus of aliens, at around the five and a half minute mark. A bit of “We Wish You a Merry Christmas” is played on piano as this begins. Then spacey atmospherics rise up to move the piece into the Lovecraftian territory. It works through quite a growing process before eventually getting mellow again at the end. There are Middle-Eastern elements at play here. This is electronic and rather trippy in a lot of ways. There is a lot of spoken stuff in this cut. I love some of the melodies, too. This is a bit on the creepy side. It’s also mysterious and powerful. There are weird monstrous sounds in the mix at times, too. There is a rather tribal rhythm section to this. Add to that weird sound effects and atmospherics. Bits of odd melodies come across. There are creepy things in the mix. It’s rather noisy and out of control. This really gets unsettling at times. The chanting becomes overpowering and frightening. Sound effects take it at the very end. This is pretty. It’s not ominous, but actually restful. It’s otherworldly in a lot of ways. It’s also rather restful and refreshing. We really kind of needed that after the chaos of the last piece. This starts fairly pretty and rather peaceful. As time goes on it grows into weird sounds and gets very creepy. Pretty music starts this and builds outward. This is gentle, but also a bit twisted and strange. It’s a little on the creepy side. It’s also dramatic and very much in an electronic prog type of territory. It does feel rather ominous in some ways. A tolling church bell opens this and moves it forward from there. Other elements come into the mix, including a spoken chanting like by a group of people. That feels a bit distant and processed. It gets weirder and more chaos driven as it grows. Those chants shift and change into something non-human and monstrous. Effects work around the backdrop, too. Then the whole thing turns otherworldly, and in a frightening way.